Popular culture portrays Vikings as violent raiders who plundered Europe's coasts with impunity, but recent research indicates that the Vikings were vulnerable to at least one threat: a changing climate. 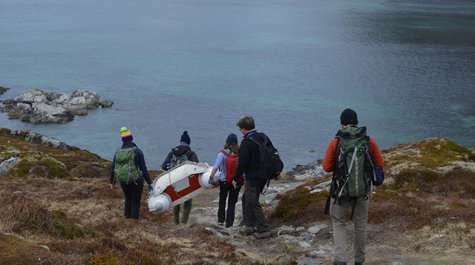 William & Mary geologist Nick Balascio recently returned from Norway. He is part of a team of climate researchers, archaeologists and students working to understand how environmental changes influenced the Viking society during the Iron Age. 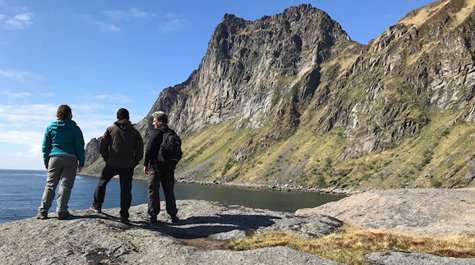 The research team, a collaboration between William & Mary, Columbia University, Tromsø University and the Lofotr Viking Museum, overlooking Lofoten. The chain of islands along the northern coast of Norway developed during the Iron Age from small agricultural outposts to major Viking centers. The team plans to use biogeochemical markers remaining in the lake sediment to record changes in the environment and reconstruct human activity patterns on the islands. "In some of these coastal regions, the Vikings are able to move their ports because of sea-level change," Balascio said. "Access to a port was particularly important because fishing was one of its key resources. When sea levels affected access to the port, the chiefs had to find a way to preserve trade and power. " Lofoten The islands are above the Arctic Circle, making the region a particularly interesting case study in climate change research, Balascio said The Vikings were able to develop an agricultural settlement on the fringes of agriculture, and the Vikings also relied on access to the sea, as cod was one of their major commodities, and these two factors prompted Balascio to look for signs of environmental change For even the slightest change would have greatly influenced the Viking civilization. "Shortly towards the end of the Viking Age, we still try to determine the exact chronology, you see the task of all these Viking boathouses," said Balascio. "They probably moved to another stretch of coast because the sea level dropped." Unlike the sea-level rise, which climate researchers see as a major threat today, Lofoten has experienced a relative decline in sea level. As glacial ice melted, its weight was lifted from the land and the earth's crust rose. In fact, the country rose so fast that entire Viking chiefs remained without access to the ocean, Balascio explained. The harbors became an inland port, as the harbor had literally risen from the sea. Climate change caused a decline in sea level relative to the past 10,000 years due to the region's particular geology, Balascio said. It's not that the water is drying out, it's that the land has been raised. Glaciers once formed a large part of the Arctic landmass. As they melted, the pressure removed from the earth's crust dissolved the underlying land. Image that got up after laying down a mattress. The impression left by your body increases until the mattress returns to its original shape. Although much of the Arctic ice melted long ago, the land that once covered it still recovers from its glacial burden. This continual adaptation of the Earth's crust is called glacial isostatic adaptation. Balascio took his first expedition to Norway as Ph.D. Student in 2007. For most of the past decade, he wanted to return and build his early work there. Last year he received financial support from the National Science Foundation to return to Norway. His current research focuses primarily on the use of biomarkers in lake sediments to capture environmental and social changes during the Iron Age (circa 500 BC-1100 AD). "A major goal is to test the hypothesis that level variations had an impact on settlement patterns," he said. The team began fieldwork last year, with two Geology students, Moussa Dia & # 39; 18 and Eve Pugsley & # 39; 18 helping to collect samples. This summer, on a return trip, Leah Marshall & # 39; joined the field crew. The experience was hardly a vacation. "We are working on these small, inflatable rafts to collect sea sediment," said Balascio. "It's exciting, but it's also very uncomfortable." Lofoten Island Lakes were created by glaciers, explains Balascio, meaning they are extremely deep – between 60 and 150 feet. While today they are lakes, they used to be ports that led to the sea. The sediment of the lakes contains the key to understanding this transition. The field crew is responsible for the gutting of the lakes and takes long sediment tubes from the lake floor. The core tubes are lowered by ropes over the sides of dinghies, filled with sediments and then pulled up from the depths. "This is the hardest part of working only on lakes that are so deep," said Balascio. "We have to recover the cores intact and we're not on big ships, we're on those little rafts." Back in the lab at William & Mary, Balascios students Dia, Pugsley and Marshall have helped analyze the samples to try to compile historical records where there are none. Much of what remains of the Viking history has been passed down through folklore, Balascio said, so his students use geochemical analysis to create an ecological and archaeological narrative. "We analyze sediments and try to provide chronological information and correlations through radiocarbon dating," said Balascio. "When you go back in time, the records get scarcer, you have limited information because there are no written records." Sediment analysis is still in its early stages and Balascio expects it to be. Just a year ago, he had a clear picture of how the Vikings responded to climate change. Even at this stage of development, Balascio says, he already begins to understand how people live in one of the harshest environments on earth. "It is a good reminder that people have responded to climate change and adapted to it for a long time," said Balascio. "It's not something that is necessarily new or has happened to global warming in the past 150 years, something that civilizations have been working on for a long time."